WASHINGTON — Drivers may experience delays on the George Washington Parkway Wednesday as an emergency pothole repair effort continues through the day. Potholes on George Washington Parkway disabled 15 or more vehicles Tuesday night, causing a portion of the roadway to be closed for emergency road repairs. From roughly midnight until about 4 a.m., the northbound lanes of the parkway were closed between Spout Run Parkway and Route 123. Road crews used about 5 tons of asphalt to patch the potholes, says National Park Service Spokeswoman Jenny Anzelmo-Sarles. Since last Tuesday, 20 tons of asphalt have been used to repair potholes on the George Washington Parkway. Near the Central Intelligence Agency exit, a collection of potholes was described as a minefield. Two large craters north of Spout Run Parkway claimed numbers of vehicles. On Wednesday, drivers can expect to see rolling roadblocks along the George Washington Parkway as road crews search for and repair potholes they may encounter. Crews are working on Spout Run Parkway outbound from George Washington Parkway to Lorcom Lane. After that, crews will do work on the inbound lanes from Lorcom Lane to George Washington Parkway. Anzelmo-Sarles asks driver to be patient as they see delays or encounter the road crews working on repairs. An overnight worker who drives the stretch regularly says the roadway was in decent shape Monday evening. Tuesday’s rain likely caused an acceleration of deterioration of minor road cracks into major potholes. “Drivers are advised to use caution on all area roads because the recent weather changes (from freezing temperatures and snow to warming temperatures and rain) are causing road damage throughout the region,” Anzelmo-Sarles said in an email. Tow trucks pulled cars off the roadway in the early morning hours Wednesday putting up to a half dozen in each of two scenic overlooks and in the parking lot for the U.S. Park Police substation near the exit for CIA. 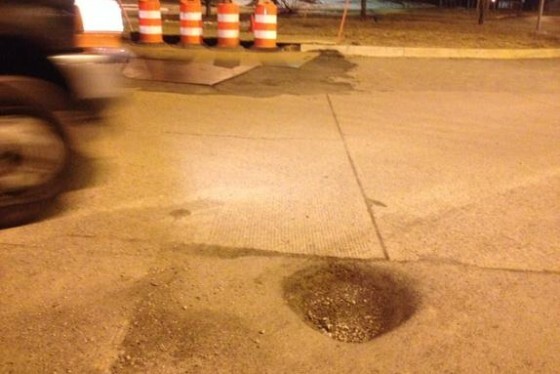 If you see a pothole that needs to be repaired, call 703-289-2500 or email Gwmp_superintendent@nps.gov. Last December, one lane of the parkway southbound was closed for almost a day because of a pothole described as a “sinkhole” adjacent to a concrete bridge deck near Spout Run Parkway. That closure caused traffic congestion for miles as drivers adjusted routes because of the closure.